The annual Australasian Law Awards were held at The Star Sydney last night with the best firms, in-house legal teams and deals revealed. 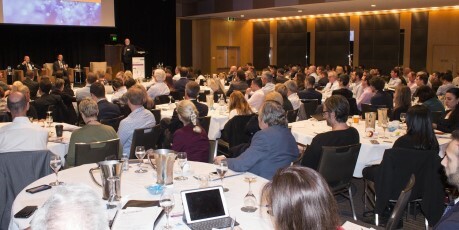 Sponsored for the third consecutive year by official partner FTI Consulting, the event was attended by a full house of 676 of Australia’s top legal professionals. Awards were presented in 34 categories covering firms, in-house teams and deals. Journalist and author Peter Fitzsimons was back in the hot seat as MC for the night. Guests were entertained with a surprise performance by singing waiters act The Three Waiters as well as acoustic band Luke Zanc Trio, who created a unique spin on classic tunes. Clayton Utz was one of the big firm winners last night, featuring in several winning deals and taking home the JLT Employee Health & Wellbeing Award as well as two individual awards – Young Private Practice Lawyer of the Year (30 or under) for rising star Thomas Dougherty, and Scarlis Pringle Law Firm Leader of the Year (>200 Employees) for the firm’s chief executive partner, Rob Cutler. Across the Tasman, Fonterra Co-operative Group’s in-house team proved unstoppable, winning Russell McVeagh NZ In-house Team of the Year for the third consecutive year. It was IFM Investors that picked up the Clayton Utz Australian In-house Team of the Year, while the prestigious Australian In-house Lawyer of the Year award, sponsored by FTI Consulting, went to Brookfield’s Claire Bibby for the second year in a row for her contribution to the legal profession. In a year marked by several significant deals, the award for Australian Deal of the Year went to the Acquisition of Asciano by Brookfield and Qube. One of the largest ever takeovers executed in Australia, the deal involved a line-up of the country’s best firms: Allens, Baker McKenzie, Bell Gully, Clayton Utz, Gilbert+Tobin, Herbert Smith Freehills, Jones Day, King & Wood Mallesons and MinterEllison. Congratulations to all of last night’s award winners. Photos and video coverage from the event will be available next week at www.auslawawards.com.au and in an upcoming special edition of Australasian Lawyer.